Its been inside you all along. The idea started by booking a multi-city ticket to Tegucigalpa, Honduras because one way tickets were outrageous. I had to travel anyways, so why not make a trip out of it. Except I didn't plan on this trip to last for over 2 months. After 2.5 months in Europe, I have spent time with some of my favorite people on the planet. I can conclude a couple of major things that have impacted me more than I could have imagined. Here's the story of how people in Europe and places in Europe affected my creativity. I really had no expectations when starting a church. I was there to discover a new city and build friendships. 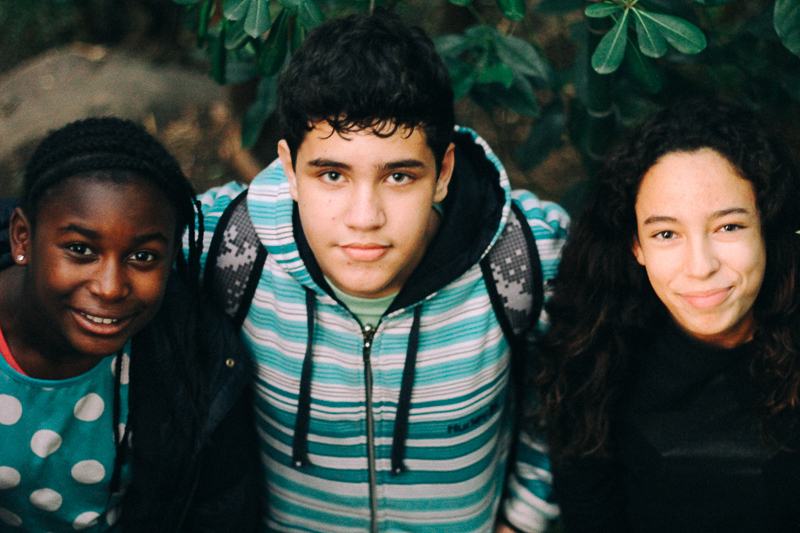 I believe I'm good at building intentional friendships and community, as well as adjusting to different cultural groups; so starting a church in Portugal seemed like a natural fit for me. After spending 2 months with amazing people, the biggest thing I learned from the leadership team at V21 (the church in Portugal), was that everyone needs Jesus. You would think that after accepting Jesus at the age of 5, I would really know that I people need Jesus. This was not my first "mission" trip, but it was the longest one I’ve been on. Being in Europe solidified this belief, the belief "that people need Jesus"; it went from being something I thought about in my head to something I believe in my heart. Gonzalo, always looking fresh, a creative soul trying to find his way. Watching Arlindo Camacho take picures of Andre. To know that there is someone who loves you entirely, who gave up his life just for you, who wants to know ALL of you IS LIFE CHANGING. I would spend hours in the subway looking at people. Suddenly, I would start crying, it happened during rush hour, it happened while the subway had less people. When I asked God to show me how He views the world through his eyes my heart saw a small glimpse of how much He loves us, my only response was to let the tears roll down my cheeks. 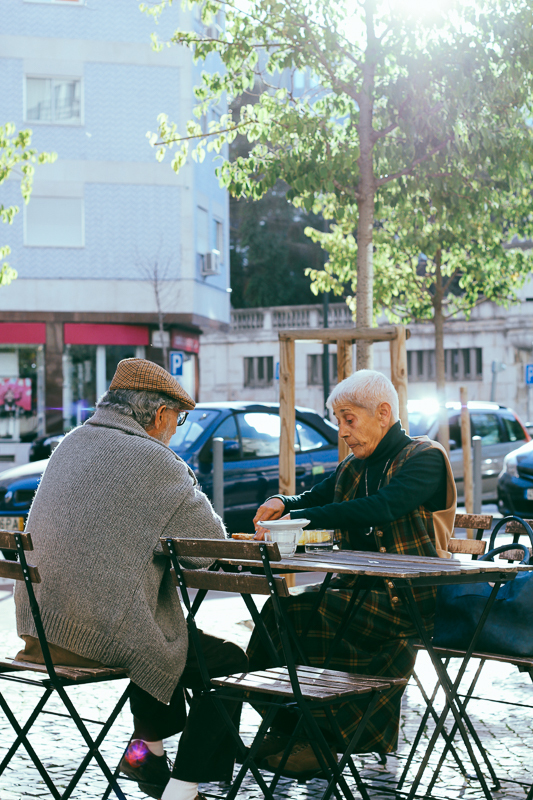 Old couple having coffee. Taken as I sat at a coffee shop to work. Any sort of travel is exciting. I wanted to see as much as I could, and experience as much as I could. While I did get to spend time with many friends from all my different areas of life, I also spent ALOT of time on my own in the last 2 months. As I explored and observed, I decided I needed to slow down, to really absorb where I was and what I was doing. I was at the park one day, and these teens showed up. I had climbed a tree and they were surprised a 20 something year old was looking at the sky while sitting on a tree. Nonetheless they appreciated my sense for curiosity and we had a great conversation. I would grab my computer and go work on my graphic design jobs for a couple of hours. 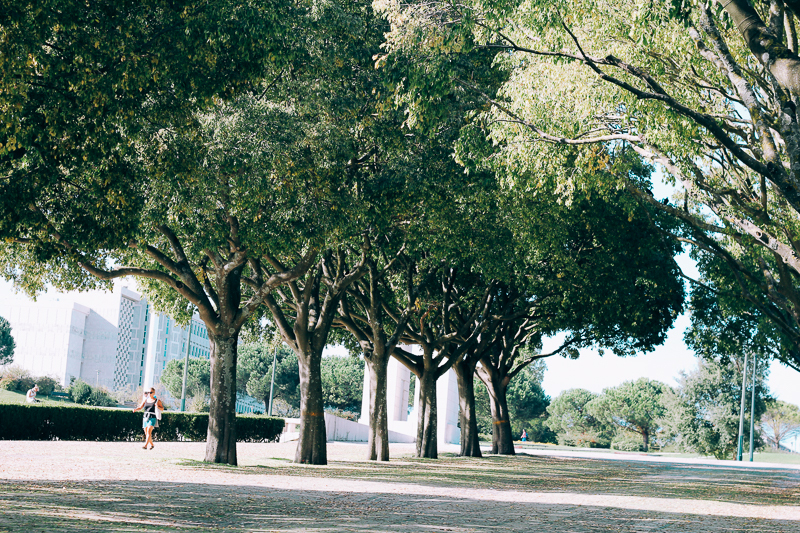 I would walk over to a park for lunch and look at the trees or watch the tourists explore the city. Sometimes I would just sit on a bench in the street and look at the locals as they walked by. Everything inspired me: I noticed lines, shapes, textures, colors, movement. As I took pictures I took these concepts and decided to make them my own. I started focusing on BEING, which resulted in a creative response of DOING. Being in Europe ignited my creative flow, way beyond anything I could image. I've always loved kids. They have an innocence and curiosity through which they see life that ignites something within me. Many of the experiences I had in Europe made me feel like a little kid. A kid sees possibilities, so I started seeing more possibilities. I started to experience life with the fullness of human emotion: making life a little more interesting. The thing is many times I can't physically express the emotions, but I continue learning how to do so, and many times expressing those emotions through a brush and paint makes sense to me. View from Parque Edoardo VII. Example: a couple of days before leaving I decided to get tickets to watch FC Barcelona play a match. I was flying out of Barcelona to come back to Honduras. I love sports and really wanted to see Messi play, because he is Messi and the team was BARCELONA. Unfortunately, Messi wasn't in the starting line up, but I did see many other greats: Neymar Jr, Pique, Stegen, Sergi Roberto, etc. etc. Back to the sense of wonder, on my way to the stadium, I hopped on bus line H8, and was off. I saw grandparents and their grandkids, teenagers, tourists, locals. My heart was beating so fast because I was so excited. I had seats right behind the goal and saw so many of the plays up close. During the first 45 minutes there was so much stress and excitement, etc. I was at one of the Meccas of the sport. My seat was next to a group of kids and their parents. I felt like they did, excited to watch their heroes, the best of the best. It is this sense of wonder, from enjoying a soccer game to looking at trees or buildings or staring at the stars, that I hope to keep throughout my life. The sam excitement would happen when I would go to the beach. I've loved the ocean since I was a little girl. If you love the ocean and water you understand this feeling. That moment when my toes touch the water feels like the vast blue was made just for me. I wrote about that before, but it is that sense of wonder that helped me prioritize God as most important. You’re probably thinking: really? You didn’t know that already? I don’t think I realized how much I need to create. I work on graphic design & marketing daily. I take pictures almost every day (thank you Apple). I paint on a weekly basis. I was surrounded by friends who make music daily (seeing them work also inspired me, whether they know it or not). There was something about being in a place where design and art is at the core of life that affected me deeply. I went to over 10 art museums and was inspired by what I saw. During the last month in Lisbon I worked on a painting collection that I had started in Nashville. I started painting almost daily. I realized that creating is something that I NEED in order to have my sanity, in order to BE MYSELF. Since 2010, I've wanted to have a solo art show. To have an art show, one must create a collection. Earlier last year I started pursuing the creation of a collection. It took a while to land on a theme because I didn't want to feel boxed in as an artist, or show a part of me that wasn't true. Last year was full of personal growth and maturity. The collection I worked on talks about my walk with God, and what He's been doing in my life during the last year. It is the most vulnerable and raw work that I've ever created, and for a first painting collection I wouldn't have it any other way. My trip to Europe was a time where I learned about who I am as an artist and why I am this way. Europe showed me more of who God is as a creator, and why he made me, why he gave ALL OF US creativity. Of course, every artist wants to create something beautiful, something impactful: that is the walk of an artist, a musician, a poet, a creator. The barriers I had prior to coming up with the concept of the collection were instantly removed, and it suddenly all made sense. As I re-learned how to be a kid in a world with so much history, I learned that I really am a hopeful romantic. You’ve probably heard the term a hopeless romantic, many artists are labeled that. The artists, writers or musicians I read about in high school would get so inspired that some of them would be on the verge of crazy because of their muse/source of inspiration. I, however, am choosing a different term: I choose to be hopeful. I choose to take in the beauty of all different aspects of life, knowing that I can walk boldly because I walk with a God who is way bigger than anything I could create. Viewing life as a kid does gives me a different perspective and allows me to know God in new ways, creating inspiration within me and therefore making me: a hopeful romantic. God loves his children. God wants his children to be with him. Because we are his children we can see life with a sense of wonder (even when we are grown up). Approaching life this way only generates a deepening of love for God because you KNOW Him more and he KNOWS you. When you love someone you respond in the expression of that love: for me it was an expression through paint. So, while I thought I was going to Europe to help start a church, I think the people and places I saw affected me more than I affected them (maybe?). Regardless, I'm thankful for the opportunity I had and hope to use what I learned during this time as a platform for life. 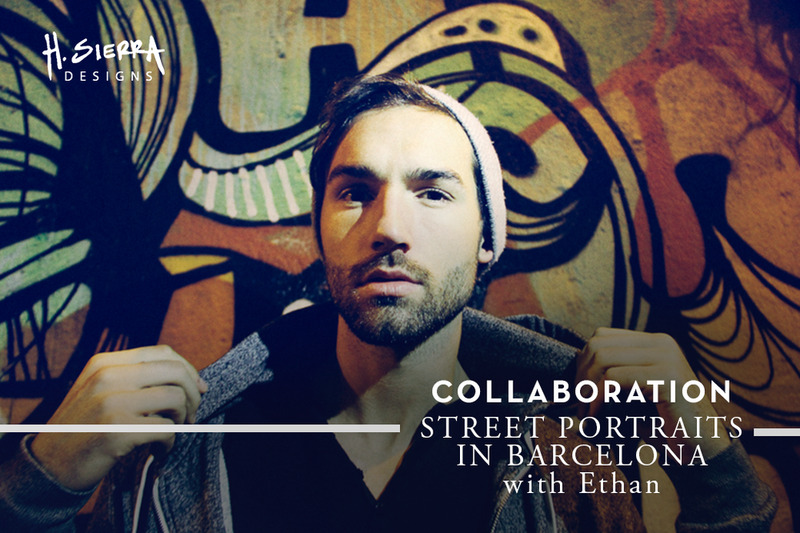 After not seeing my friend Ethan for 3 years, collaborating on a photo shoot in the streets of Barcelona was a great way to catch up on life.